Gov. Rick Perry is slated to name Michael Williams the new commissioner of the Texas Education Agency, a source close to the governor said Monday. 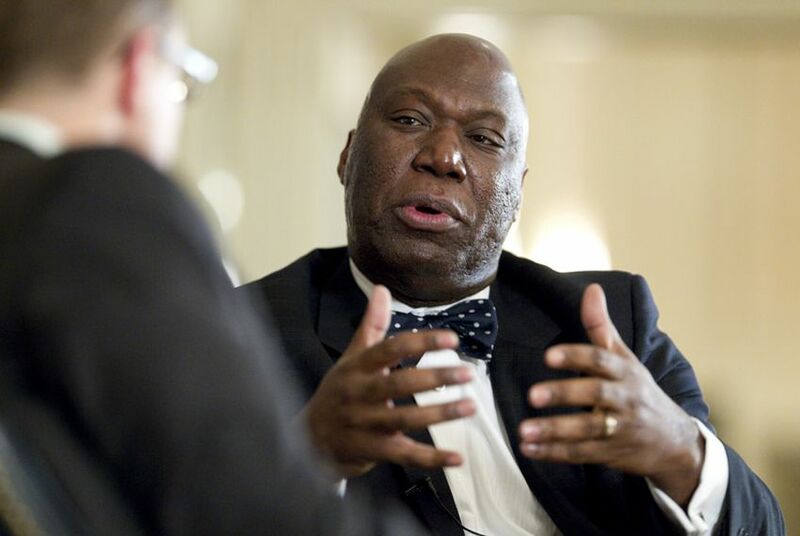 Education Commissioner Michael Williams, a former railroad commissioner, is shown at a TribLive event on Jan. 27, 2011. Gov. Rick Perry named Michael Williams the new commissioner of the Texas Education Agency Monday. A fixture of Texas Republican politics — and a former general counsel to the Republican Party of Texas — Williams resigned from the Texas Railroad Commission in 2011 after serving more than a decade on the regulatory body that oversees the state's oil and natural gas industry. His appointment comes at a trying time for the agency, which lost a third of its workforce after budget cuts last year. Amid anxiety from parents, educators and administrators — and backlash from lawmakers — over its transition to a rigorous new assessment and accountability system, the state is facing six lawsuits over the way it funds public schools. More than half of Texas public schools failed to meet yearly benchmarks under the No Child Left Behind Act, but the state remains one of the handful that have yet to seek a waiver from the requirements from the federal government. The agency will also begin the Sunset Review process in October. Williams, who began his career as an assistant district attorney in Midland, has recently been known as a political candidate. After showing early interest in replacing Kay Bailey Hutchison in the U.S. Senate, he campaigned for the congressional district now held by U.S. Rep. Lloyd Doggett, D-Austin. Williams lost the Republican primary to Wes Riddle and fellow onetime U.S. Senate candidate Roger Williams, who ultimately prevailed in a runoff. When then-Gov. George W. Bush named Williams to the commission in 1999, he became the first African-American to hold a statewide elected position. The Midland native's career in GOP politics began during the Ronald Reagan administration, when he served as a prosecutor at the U.S. Department of Justice. In 1990, President George H.W. Bush appointed him to the civil rights division at the U.S. Department of Education, a legal position that is his only official previous experience in the realm of education policy. In that regard, the governor's appointment of Williams is a departure for the agency. His immediate predecessor Robert Scott, was a longtime TEA official and adviser to Perry on education issues. Before Scott, all previous TEA heads were former superintendents or school board members. Perry simultaneously named Lizzette Reynolds, a veteran of the agency who is currently a deputy commissioner, as Williams' second in command. Reynolds attracted controversy in 2007 when she allegedly pushed to fire the agency's then-science director Chris Comer for forwarding an email critical of intelligent design in violation of an internal neutrality policy. After Comer was forced to resign, the agency drew national scrutiny that included an editorial in The New York Times. Despite his lack of a formal background in education, Williams has not ignored education issues in his political life. In the late 1990s, he served on the board of the center for New Black Leadership, a conservative think tank that opposed racial preferences in education and the workplace. While there, Williams spoke out against affirmative action policies and in favor of private school vouchers across the country. School choice and voucher programs, the subject of a recent state Senate education committee hearing, promise to be a hotly debated topic during the upcoming legislative session. The U.S. Supreme Court will hear oral arguments in a lawsuit attacking the University of Texas' affirmative action policy in October. During his time as general counsel for the state Republican Party, Williams also expressed interest in education issues, said Wayne Hamilton, who was the state GOP's executive director at the time. He remembered Williams' commitment to supporting charter schools as a solution to failing public schools and drawing a firm line on keeping schools accountable. He said Williams is "someone who has always shown the ability to be open-minded to anything to make whatever it is he's working on excel." "The secret to Michael Williams is his ability to not say no to a new idea until it's been vetted and considered," he said. Peggy Venable, the state director of Americans for Prosperity's Texas branch, also praised Williams. Citing his background as a prosecutor and district attorney, she said in a prepared statement that he was "a no-nonsense administrator who would not hesitate to shut down bad charter schools." The Texas State Teachers Association offered a less enthusiastic response to the appointment. "We hope that Michael Williams will at least listen to teachers, the real education experts, rather than promote the profiteers who would siphon tax dollars from the public schools for vouchers and other privatization schemes," President Rita Haecker said in a prepared statement. "But the real problem for Texas public schools is not the education commissioner. The real problem is Rick Perry. As long as he is governor, Perry will continue to try to shove public education in Texas back into the nineteenth century." Williams, whose parents taught in public schools, holds an undergraduate, master's and law degrees from the University of Southern California.